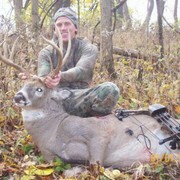 Professional outfitters work year-round to offer clients the best shot at a successful hunt. I’ve been a full-time whitetail guide for many years, so I know that preparing for the upcoming season is a year-round endeavor. In addition to the many pre-season preparations, we take notes during the actual hunt as to what worked and what didn’t so we can continually improve our performance in the field. From that stand point, we’re preparing for the next season before the current season ends. But it’s not just up to the guide. As a hunter, there are a few things you can do while in camp in order to increase your chances of success – and get your best shot at a trophy buck. In my opinion, nothing has a more profound effect on the outcome of any hunt than to arrive in camp with a positive attitude, and a readiness to adapt to the elements. Driving rain, bitter cold, hot days, sleet, snow, howling winds, bugs, dogs, cows, coyotes, little or no game movement – you’re bound to experience any, or perhaps even all, of these conditions at some point in the season. The only thing I know of that will keep a hunter focused and on the stand under these varying conditions is a never-say-die attitude. This attitude will take whatever mother nature throws at him and continue to hunt hard. Conditions can change in an instant, and you have to be out there if they do. Furthermore, if a miss or a bad shot is made, mentally pick yourself up and get your head back in the game. This is much easier said than done, but it’s a serious hunter’s greatest asset. Make sure your equipment is sighted in well before your hunt, know the max distance you’re comfortable shooting to, and stick to it. Confidence can take on several different forms. Here, I’m primarily talking about confidence in one’s abilities. Whether a gun or an archery hunter, there’s no excuse to not be lethal with your weapon out to the range you intend to shoot. You can control few variables as a hunter, but you should master those you can, like confidence in your ability to make clean kills at reasonable ranges. Make sure your equipment is sighted in well before your hunt, know the max distance you’re comfortable shooting to, and stick to it. Success in the field builds confidence, and confidence in the field promotes success. Likewise, have confidence in your guide; give him the benefit of the doubt, even if you don’t agree with where he’s placed you. Your guide has spent all year scouting the area, watching the trail cameras, and setting up stands. He knows every inch of his property, and the bucks that frequent it. If you, as a hunter, convey confidence in your guide, he’ll continue to work hard on your behalf. As I’ve matured as a hunter, I’ve come to realize we all have different ideas of what defines “success.” Some hunters will be the hard-core guys, hell-bent on giving 100 percent effort and braving any elements mother nature throws his way. Others just want a few days away from their daily grind at the office. That’s OK, too. Still others will fall somewhere between these two extremes. I must admit that during my guiding career I’ve struggled with the concept of, “hunting through my hunters.” I would almost unconsciously expect clients to put the same amount of effort into their hunt as I would my own. This works fine for the hard-core guy, but not so well for other clients. I’ve learned to constantly remind myself that their hunt is just that: their hunt, not mine. As a guide, it’s our job to determine what each client wants and do our best to help them find it on their hunt. It’s important to talk to your guide about expectations for your whitetail hunt, including whether you prefer to sit in a tree stand or ground blind. Professional guides know that in order for our clients to be successful in the field, we must be as serious about their success as we are guiding. Most guides tend to be a little over zealous in their attempts to help clients succeed, myself included. This is only natural. We want to build a solid reputation for our business, and that’s not a bad thing. Most hunters come to camp expecting to harvest an animal (little argument there). The question, then, is what caliber of animal, and what are the chances for success? To a large degree, it’s the outfitter’s responsibility to educate a prospective client on realistic expectations. If you promise more than you can deliver, you’ll have major problems ahead. Let a client come into camp expecting multiple opportunities at 150-inch or better bucks and see how quickly his sour attitude can affect camp morale. On the other hand, if hunts provide more than was promised, most will want to return to hunt again. This holds true not only with expectations of trophy quality, but also with camp accommodations. I’ve operated hunts out of everything but a tent, including motels, hotels, lodges, and farm houses. In every instance I carefully explained to each prospective client what they could expect for accommodations long before they arrived to hunt. With very few exceptions, our clients have been more than satisfied because they knew on the front end what to expect. Before arriving to deer camp, talk to your outfitter about your goals, the accommodations and what you should do to prepare. As a rule of thumb, I’ve found if the hunting is good enough, it covers a multitude of sins. It’s when the hunting is tough, that a good outfitter earns his stripes. I have been a full time outfitter for over 30 years and your article is right on the money!! VERY well said, great article. Having just completed another guiding season in the mid-west, I would like to add a little foot-note to my article above. Each hunter should come to camp prepared mentally and with appropriate apparel for the worst weather conditions they could possibly encounter. This season was brutally cold with high winds, the bucks were still on their feet at times, but sometimes our clients were not able to withstand long hours on stand in these conditions. Quality hunts are never cheap. For that reason, it is vital to have the best cold weather clothing available . I can be contacted for the particulars, but good equipment is worth every penny when you are in your stand and big boy come by. Confidence that you and your gear will be able to withstand tough conditions is invaluable.